I'm currently sitting in a motel in Grand Junction, Colorado, munching my way through a bowl of fruit salad I bought from the supermarket opposite (it's actually possible to eat too much restaurant food, I'm discovering, and I had a hankering for something simpler for breakfast today!). I took a bit of a gamble with my route out of Moab, and I'm glad I did. 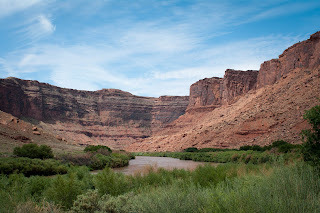 Rather than re-join the I-70 as it blasted across the lunar landscape of Utah, I thought I'd join a much smaller road that followed the route of the Colorado river. The road was tucked in the gorge alongside the river, with huge red cliffs on either side. I could see how, later, this could be the river that carves the Grand Canyon. Every now and I then I'd see brightly coloured rafts zipping down the river. White water rafting is popular round here - and the Colorado is a fast moving river. I'm not sure you'd get me doing that. Eventually I had to rejoin the interstate, crossing into the state of Colorado and arriving at the Colorado National Monument. The Monument is similar to the Arches from yesterday - a huge sandstone mesa, eroded into hundreds of canyons and columns. But unlike the Arches, you drive to the top and look down. 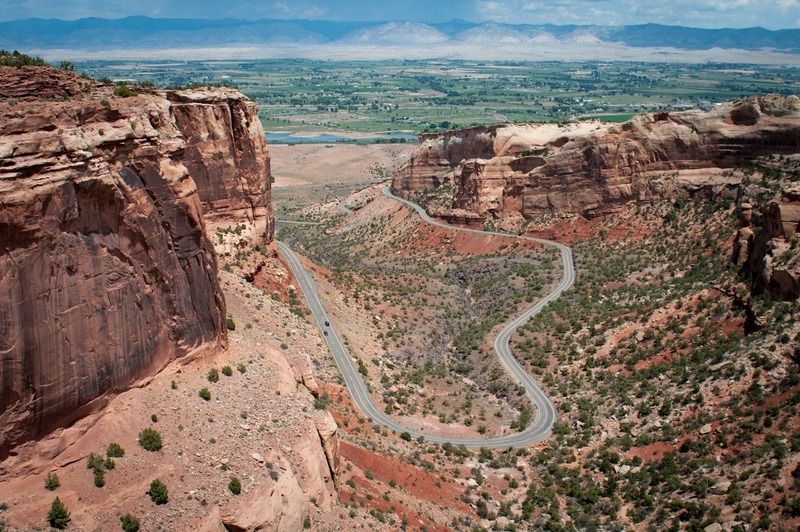 So the first stage is to climb 2,000 feet via a narrow road cut into the sandstone. There are many switchbacks and sharp bends and a worrying drop down one side. A great drive, but a little nerve wracking. 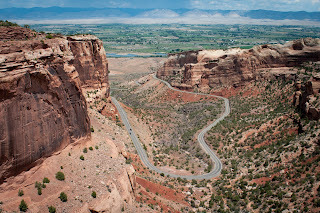 From the top, you get huge views of Colorado and get to stand on the edge of many vertiginous canyons. From there it was back down to Grand Junction - named because it's on a fork of the River Grand, as opposed to having any grand pretensions. Actually, it's a compact little town with a smart, affluent restored downtown. People were out and about even on a baking hot Sunday evening. 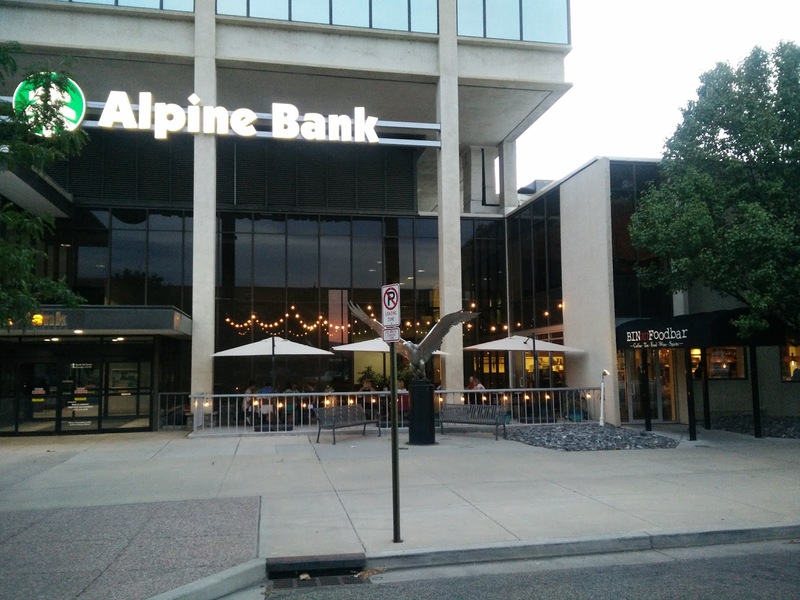 I tested the local brewery (it would be rude not to - and every town in Colorado seems to have one). 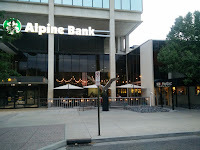 Then I treated myself to a gourmet burger at a local restaurant - that appeared to be in the lobby of a bank. Still a delicious burger though! Although situated in the lobby of a huge bank, this place has plenty of atmosphere. Apparently, everything is sourced as locally as they can - and I can recommend the Colorado red wine! I started with crispy cauliflower (delicious) and had the 'bin burger' for main - which was superb too. Highly recommended.